Just like barbecue food and beer, a sea of humorous signs are simply part of the college football tradition thanks to ESPN's College GameDay show. But during this past Saturday's broadcast from Bristol, TN, it looks like one college student managed to capitalize on the ritual in a big way with a sign requesting "beer money" via his Venmo account. Since then, he's received more than 2,000 beer money donations. Really. An enterprising -- and thirsty -- college dude named Sam Crowder managed to squeeze a sign into the frame during the College GameDay show reading, "Hi Mom! 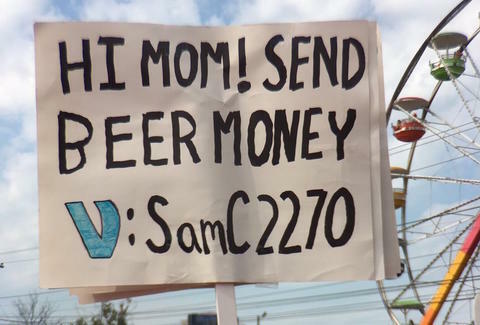 Send beer money" along with his Venmo username, SamC2270, according to a report by ESPN. As ESPN explains, the $50 contribution alone was enough to cover a six-pack of Budweisers, which sold for $7 at the game between Virginia Tech and Tennessee. But it turns out the beer-fueled generosity didn't stop there, and hundreds of additional Venmo payments arrived from all over the country. By Saturday night, more than 2,000 people had contributed, according to Venmo, and that number has likely grown since then. Unfortunately, Venmo doesn't make the value of each payment public, but it's probably safe to say Crowder won't have to worry about scraping for beer money for at least a little while. So far, there's no word on whether Crowder's mom ended up among the many people who contributed, according to multiple reports. We attempted to contact Crowder via a Twitter account claiming to be him in hopes of learning about his plans to use the cash and whether he'll pay it forward to others. With any luck, he'll cover the next round. Tony Merevick is Cities News Editor at Thrillist and hopes this guy pays it forward. Send news tips to news@thrillist.com and follow him on Twitter @tonymerevick.